The father of rock ‘n’ roll, a towering figure in music across the years and possessor of one of the most expressive resonant voices in history who could effortlessly adapt his songs for virtually any style, tempo and instrumental backing, changing their meaning entirely without altering a single word by virtue of his delivery alone. Turner was born in 1911 and a few years after his father was killed by a train when Joe was just four years old he got his first job leading a blind singer through the streets for 50 cents and his career in music was launched. He honed his timing by singing along to an uncle who was a nightclub pianist and when he was old enough – or LOOKED old enough, as the fourteen year old already stood 6’2” tall – he’d apply his mother’s eyebrow pencil to his upper lip to approximate a mustache and slip into the thriving clubs around town. Kansas City in the 1920’s and 30’s was a wide open town that roundly ignored the edicts of prohibition, as liquor flowed in clubs which remained open 24 hours a day with gambling and prostitution viewed not as illegal vices but harmless sidelines. The added inducement to entering these dens of inequity was the music. Pianist Pete Johnson was leading the band at the Black & Tan and the under-aged Turner finally convinced him to let him sing, sans microphone, and his voice echoed throughout the room. He was hired as a bartender whose job it was to bring in the bootleg whiskey and start singing whenever the patrons weren’t spending to revive their interest. The duo didn’t let the 21st Amendment ending prohibition slow them down any, moving to another club where they were discovered by legendary music producer John Hammond who invited them to appear at his From Spirituals To Swing concert at Carnegie Hall designed to expose black music to white society. The two promptly stole the show with what could be said to be the start of the rock approach on “Low Down Dog” with Turner’s uptempo shouting matched by Johnson’s storming work on the keys, launching the boogie woogie craze that swept much of the nation over the next few years with both Turner and Johnson reveling in the spotlight, playing extended gigs at the jumpingest joints in New York. But what followed that period was indecisiveness as Turner’s versatility amidst the changing musical trends during World War Two ensured he was always able to record, but rarely had a consistent approach over a succession of releases. When rock ‘n’ roll came into being in 1947 Turner, despite being one of those who inspired it as well as immediately foretold of it with an earlier 1947 release, “Sally Zu-Zazz”, took awhile to get up to speed, bouncing from one label to another all of whom had different ideas as to how to best present him. Not until the dawn of the 1950’s did he fulfill his destiny, first with a brief flurry of inspired sides for the Freedom label, then signing with Atlantic Records in 1951 where he was finally handled with a firm sense of direction while paired with the best musicians and sympathetic and enthusiastic producers. The result was a run of 18 hits in seven years including three of the biggest smashes of the entire decade firmly establishing his role as a rock giant. Turner’s stature as an elder statesman of rock (he was in his mid-40’s at the time of his greatest success) and the regard he was held in by other artists, many of whom had originally been drawn to the music after hearing his early rampaging vocals, ensured he’d never fade away into history entirely. However by the late 1950’s with an ever-increasing focus on youth and with tamed down lyrics to get by the sensors Turner’s heyday was finally at its end after twenty years in the spotlight. He returned to the musical settings he’d left behind more than a decade earlier, reunited with Pete Johnson and playing jazz festivals, cutting blues tracks and once in awhile appearing on a rock show, often backed by Bill Haley and The Comets, as Haley, who’d covered Joe’s “Shake, Rattle & Roll” in 1954 and had the Pop Hit while Turner’s was the biggest R&B hit of the year, had become great friends with Big Joe on tours throughout the fifties and even lent him his band to cut a record in the 1960’s. Turner’s girth was now reaching four hundred pounds and with it came health problems including diabetes and kidney failure requiring dialysis treatment. Turner, who’d been robbed of songwriting credits, not to mention never paid royalties after leaving Atlantic despite their keeping his biggest songs in circulation and on compilation albums for decades, was forced to continue performing into his seventies, often while using a cane or while seated, just to make ends meet. Like so many others even the Father Of Rock ‘n’ Roll saw those who made millions off him and his music turn their back on him. 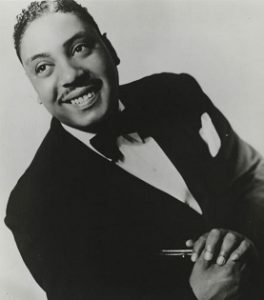 The thunder that was the voice of Big Joe Turner was finally silenced in 1987, dying at the age of 74 after a career that spanned fifty years and all of the stylistic stops along the way. As songwriter Doc Pomus put it, “Rock ‘n’ roll never would’ve happened without Joe Turner”.